There is no doubt that people enjoy eating as one of the main features of any camping trip. There is just something special about eating delicious food at an outdoor campsite. Whenever you go camping you will see many of your fellow campers cooking hot dogs and hamburgers on their barbecues. However, have you ever thought about cooking shish kabobs or beef kabobs while camping? Kabobs are a great addition to any camping menu because not only are they delicious but they are easy to make. There is a great shish kabob recipe that everyone should try while camping. This recipe is actually a beef shish kabob because it uses beef whereas a typical shish kabobs uses lamb. The ingredients for this beef shish kabob are vegetable oil, soy sauce, lemon juice, prepared mustard, Worcestershire sauce, minced garlic, cracked black pepper, salt, lean beef, mushroom caps, red bell peppers, green bell peppers, onion, and of course at least 8 shish kabob metal skewers. The directions are very easy to follow. You simply whisk together the lemon juice, Worcestershire sauce, vegetable oil, mustard, pepper, garlic, and salt in a small bowl. Add the beef to the mixture and marinate it in a sealed plastic bag. It will need to be marinated for 8 hours in a refrigerator or ice chest. After the 8 hours are finished you then can add the mushrooms and marinate it for another 8 hours. Lightly oil the grate on your barbecue grill and preheat it. Remove the mushrooms and beef and pour the left over marinade into a small bowl. Place all ingredients onto the metal skewers and barbecue at a medium low heat. 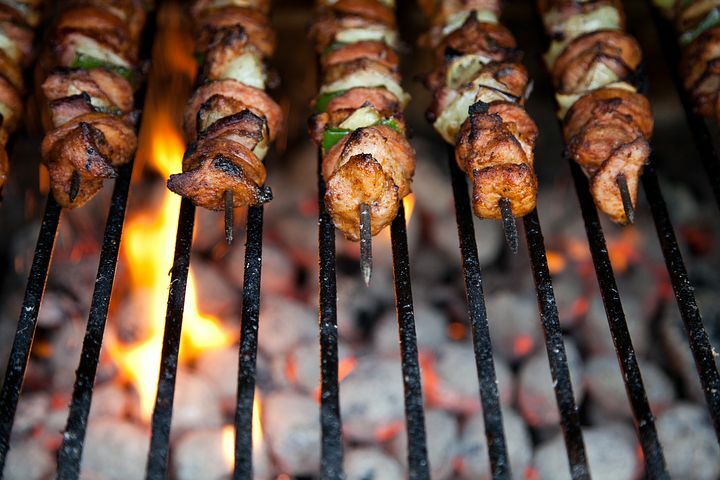 As you barbecue you must make sure that the skewers are being turned frequently as you brush on a generous amount of the extra marinade. Give it a try. We think your whole group will love it.